pKLAC1-malE is a control plasmid for the K. lactis Expression Kit (NEB #E1000). The backbone integrative expression vector, pKLAC1, directs high-level expression of recombinant protein from the yeast Kluyveromyces lactis. Vector pKLAC1-malE carries the E. coli malE gene, encoding the maltose binding protein (MBP). pKLAC1-malE can be used to test plasmid transformation, cell culture, and protein production procedures. A typical K. lactis GG799 strain containing integrated pKLAC1-malE will produce > 25 mg/L of MBP (Figure 1). Figure 1: SDS-polyacrylamide gel electrophoresis of secreted recombinant maltose binding protein (MBP). (A) Detection of secreted MBP by Coomassie staining. Lane 1: Protein Molecular Weight Markers. Lane 2: spent culture medium (15 µl) from wild-type K. lactis cells. Lane 3: spent culture medium (15 µl) from K. lactis cells harboring integrated pKLAC1-malE. 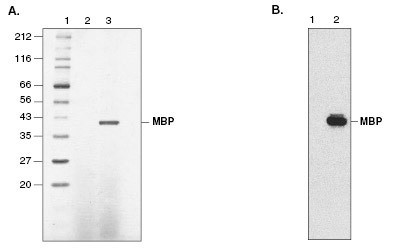 (B) Detection of secreted MBP by Western analysis using a polyclonal anti-MBP antibody (NEB #E8031S; 1:2000 dilution) and an anti-rabbit IgG-HRP secondary antibody (1:2000 dilution). Lane 1: culture medium from K. lactis cells (15 µl). Lane 2: culture medium (15 µl) from K. lactis cells containing integrated pKLAC1-malE. Always do the control transformation. This will help mediate any downstream expression issues which may arise.